I’ve achieved the hat trick of iOS device ownership—I have an iPhone, iPad, and iPod touch—so, clearly, I love the platform. But like others, I’ve long been disappointed with some of iOS’s failings. That’s why I found this week’s Worldwide Developers Conference keynote so thrilling. In his iOS 5 preview during Monday’s WWDC keynote, Apple executive Scott Forstall highlighted just ten of 200 features slated for this fall’s iOS update. And with many of those changes addressing the operating system’s glaring weaknesses, I’m confident that iOS 5 will wind up being the best thing to happen to Apple’s mobile OS since its creation. The iPhone and iPad were indisputably revolutionary devices. I don’t fault Apple for needing time to figure out how to perfect things. iOS 5 seems to be focused on righting wrongs, taking great strides on usability, and focusing intimately on the user experience. Of course, focusing on user experience is at Apple’s core, but iOS 5 strikes me as exemplifying a dramatically rekindled interest in that pursuit. Far and away, the biggest annoyance in the post-push alert iOS world is the handling of notifications. Those dopey blue alert boxes steal focus from whatever you’re doing and require interaction. They interrupt me, they confuse my kids, they stop my video playback… In short, they stink. iOS 5 may not reinvent how to handle mobile notifications—it clearly takes some cues from previous implementations on Android and elsewhere—but Notification Center will be a welcome and indisputable improvement to the iPhone and iPad experience. In fact, calling Notification Center an improvement is akin to calling the iPad an improvement on the calculator. Notification Center—coupled with iOS 5’s floating banner alerts—redefines what it means to get notified on iOS, and removes all the frustration from that process. The lock screen integration is also brilliant: New notifications will stack up on your lock screen if they come in while your device is asleep. 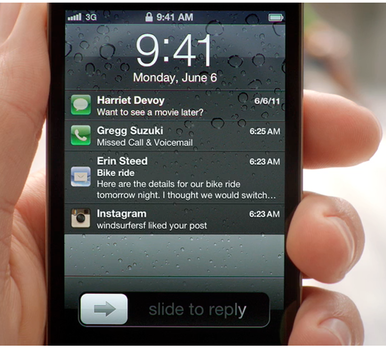 Perform the “swipe to unlock” gesture on an alert, and you’ll launch the appropriate app instantly. It’s terrific. There’s still some details to work out, like how to remove old notifications. And, as with all change, there will be a period of mental adjustment as we stop looking for the dumb blue box and look for the floating banners instead. But on the whole, the new notification system seems as well thought out as the old system wasn’t. The iPhone 4 makes a great pocket camera. (The iPad 2’s cameras are laughably bad and I try not to think about them.) iOS 5 promises to make impressive—and at times surprising—strides in the camera’s overall usability and power. When Apple introduced multitasking to iOS 4.0, I thought the only real downside was the loss of my beloved camera shortcut. Before double-tapping the Home button was bound to bringing up the multitasking bar, you could configure that shortcut to launch the Camera app directly. Apple attempts to restore the ability to launch Camera quickly in iOS 5 with a new take on that old approach. On your iPhone’s lock screen in iOS 5, double-tapping the Home button will expose a Camera button to the right of the “slide to unlock” bar. Tapping that button immediately launches the camera app. (This will work even if you use a passcode to lock your phone, but you won’t be able to review other photos or exit the Camera app without entering your code.) I appreciate that Apple wants to make it easier to take pictures faster, because I hate missing photo ops while suffering through the “tap Home to wake, slide to unlock, tap Home button to get to main home screen, tap Camera icon” dance. iOS 5’s shortcut shaves maybe a second off that process, but that can mean the difference between the perfect shot and another instant deletion. I’m also delighted that Apple will fulfill a wish of mine by allowing the use of the volume button to take photographs. If you’re unclear on how tapping a hardware button could be better than tapping the on-screen shutter control, it’s simple: Imagine tapping the viewfinder of your regular camera every time you wanted to snap a photo. It’s much easier to hold your phone steady and press the volume button than it is to hold it steady while you poke at the screen. Like its rethinking on the iPad hardware switch drama, Apple’s about-face on repurposing the volume button is a smart, customer-friendly change. Other promised camera niceties—like the ability to enhance and tweak photos on your iOS device, post them directly to Twitter without launching a separate Twitter app, and wirelessly sync them via iCloud—are all similarly awesome. These are my favorite kinds of updates: Apple is taking processes that were already easy, and making them simpler, more streamlined, and even more fun. No one—no one!—likes the current approach for transferring files between iOS devices and your Mac. Thus, even though iCloud’s magic, invisible syncing of your data will completely invalidate my own lengthy tutorial on just how to handle such file transfers, I’m happier than Steve Wozniak in a Segway showroom. Tweak a file on your Mac; it will be available and updated seamlessly on your iPad. You’ll note that—save one pie-in-the-sky wish for system-wide audio transcription—iCloud as described Steve Jobs Monday satisfies every last one of my goals for syncing. It’s invisible, available to third-party developers, and means never needing to drag a blasted file into the iTunes File Sharing box again. And it keeps your contacts and calendars in sync, too. iCloud also makes device syncing a lot better. Download an app on your Mac, and it’s automatically installed in your iOS devices. And while iOS 5’s cord-cutting isn’t quite an iCloud feature, it’s similarly wonderful: Syncing your iOS device without needing to plug it into your Mac is unquestionably an excellent upgrade. Because of what it means for sync, I love iCloud even before we get to what it means for music. A while back, I offered up a wish list of subtle improvements for the iOS, and many of them should make an appearance in iOS 5. First, iOS 5 supports file deltas—meaning you only need to download patches for app and iOS updates, not download the full, larger version of such files. And autocorrection in iOS 5 seems notably smarter based on what we’ve heard about the current developer preview. Inline dictionary definitions are helpful—and mean third-party developers can stop sweating their own. The optional split keyboard is great when you’re holding the iPad in hand, though I wish that I could save one setting for portrait (split) and another for landscape (normal). Most of Apple’s new and updated apps in iOS 5 are also solid doubles and triples. 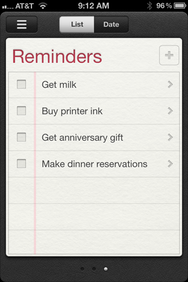 Reminders isn’t fancy, but it looks clean and sports iCloud magical syncing. Initial reports from developers using the iOS 5 beta suggest that iMessage works very well, and near-transparently, with subtle visual cues on the iPhone to distinguish between regular texting and iMessage correspondence. Safari tabs (on the iPad) will be swell, and Safari Reader’s probably going to end up more useful on the iPhone than it is on the Mac. I’m less sold on Newsstand—it seems like more of a glorified iOS folder with some special powers (like the ability to display the cover from the current issues of your subscribed periodicals). But because of that, I wouldn’t be able to tuck it into my reading folder or hide it at all. That would make me angry. But really now, let’s be serious: If my biggest complaint about iOS 5 is that there’s an unwanted folder I can’t remove, then clearly the new mobile operating system is in pretty decent shape. More annoying than Newsstand, to me, is one of Mail’s many tweaks. Most of the announced updates to Mail strike me as top-notch—full-text searching, rich text formatting, and a clever swipe to reveal the inbox drawer on the iPad in portrait mode. I fear that one new feature, though—one that some have clamored for—will make my Mail experience worse. In implementing the ability to flag messages in Mail, Apple seems to have done away with the “Mark as [un]read” link upon which I’ve grown to rely, apparently hiding it behind a second tap. The iPhone and iPad are great devices. They’re intuitive and usable and good. iOS 5 refines huge swaths of the iOS user experience, turning good to great, usable to drool-worthy. The features Apple previewed at WWDC generally fall into one of two categories: features we’ve begged, screamed, and waited impatiently for, and awesome stuff we didn’t even know we wanted. Apple says that iOS 5 won’t land until fall, so this is one year I’ll finally root for summer to pass by quickly.